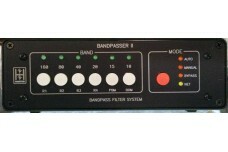 BandPasser II - Six filters for HF in a compact box. The ShackLAN Bandpasser contains six high performance bandpass filters in a single compact package and comes standard with filters for 160, 80, 40, 20, 15 and 10 meters. 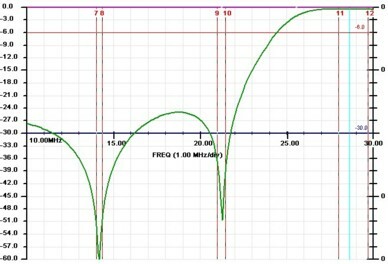 Filters for 160 m thru 15 m are 3-pole Chebyshev designs which provide over 40 dB rejection of adjacent bands (excluding WARC bands). 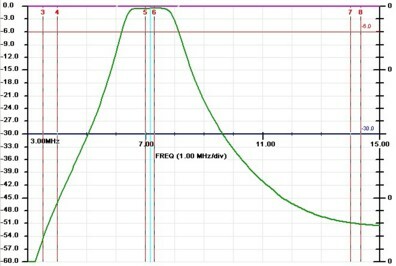 Due to the narrow separation between 15 m and 10 m (25%), the 10 m filter is a Cauer high pass design that provides deep notches on the 15 m and 20 m bands. These filters are rated at 100 W CW / 200 W SSB and can handle 100% duty-cycle modes, such as RTTY. These filters are designed be used between your radio and amplifier or antenna. 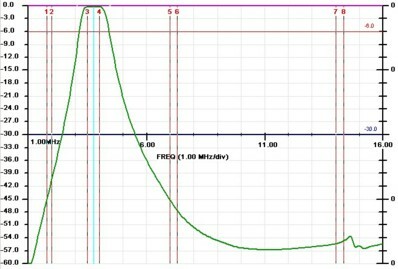 Low insertion loss (less than 0.6 db) and low SWR (less than 1.25:1) across an entire band. The filters can be selected via front panel pushbutton switches, via our ShackLAN system or remotely by applying +12 V DC for each individual band to the rear panel control connector. Bypass mode is automatically selected when no power is applied or no filters are selected. As is standard in all ShackLAN devices, the unit is protected against reverse polarity and over-voltage. normally present any problems. The Bandpasser is packaged in a heavy duty 0.08" (2.03 mm) thick wall) anodized aluminum case. Front and rear panels are laser engraved so the lettering will not wear off with use. RF connectors have teflon insulation and gold plated center pins. Power requirements are 12-14 V DC at 100 mA. Direct band decoding throught the Band Data connector for Elekraft and Yaesu without the need of external band decoder. Includes our shacklan control bus which can drive our antenna switch controllers to select antennas automatically. Installing and configuring the Bandpasser is a simple process which involves connecting the unit to your radio. You will need a length of 50 ohm coax with PL-259 connectors (not supplied). If you are using a ShackLAN equipped band decoder, such as the Array Solutions Bandmaster 3, any Hamation decoder or Integrated Controller, automatic band selection is as simple as plugging in a network cable between the Bandpasser and the decoder. No other connections are required. For stand-alone operation or use with a non-ShackLAN equipped band decoder you will also need to connect the unit to a +12 V DC power source. Control from an external device is done via the Remote connector on the rear panel. Apply +12 V DC to the pin for the desired band selection. Connector pinouts are engraved on the rear panel for easy reference. Installation steps are listed below. 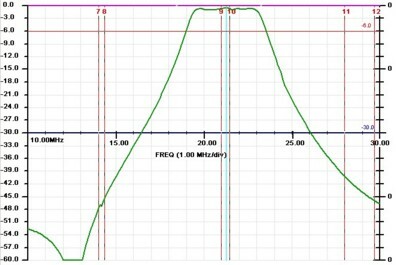 A power connection is only required when operating the Bandpasser stand-alone or wih a non-ShackLAN equipped band decoder. Power requirements are +12-14 V DC at 100 mA. The Power connector is a standard 2.1 mm jack with the center pin positive. No power connection is required when operating with a ShackLAN equipped decoder as power is distributed over the network cables. Connecting the Bandpasser to a ShackLAN equipped band decoder is done by simply plugging a 6-conductor modular cable from one of the network jacks to the decoder. Older decoders use a 4-pin screw terminal connector and an adaptor is available to facilitate operation with older decoders. Two network jacks are provided to allow easy daisy-chaining of other ShackLAN units. The two jacks are connected in parallel internally and either may be used. This step can be skipped if controlling the Bandpasser with a ShackLAN compatible band decoder or only with the front panel controls. For external control you need to apply +12 V DC to the pin on the Remote connector for the desired band. Current required for each band is 75 mA. The pinouts of the Remote connector are shown to the right and also on the rear panel. The Remote connector is a standard 9-pin subminiature female D connector. The mating male plug and a connector hood are supplied with each unit. There are two standard SO-239 (UHF female) connectors on the rear panel for RF connections. Connect a 50 ohm cable from the RADIO connect to the antenna connector on your radio. Similarly, connect another 50 ohm cable from the AMP/ANT connector to your amplifier input or antenna switch, if no amplifier is used. DO NOT CONNECT THE BANDPASSER TO THE OUTPUT OF AN AMPLIFIER OR SEVERE DAMAGE WILL OCCUR. Each time the Bandpasser is powered on it will step through each band and then flash two of the band LEDs three times. The 160M, 80M, 40M or 20M LEDs will flash to indicate the radio number (1-4) and flash either the 15 m LED to indicate Auto mode locked or the 10 m LED to indicate all modes available. After the self-test is complete the Bandpasser is ready to go. Operation of the Bandpasser is simple and straightforward. There are three mode of operation. These are Auto, Manual and Bypass. You can step through the three modes by pressing the Mode button. Aslo, pressing any of the Band buttons will automatically place the unit into Manual mode. The Auto mode is used when you want band selection to be done from an external source either from a ShackLAN compatible band decoder via the network or other type of band decoder via the Remote connector. Select Auto mode by pressing and releasing the the Mode button until the Auto LED is on. This mode is used when manually selecting filters from the front panel controls. Pressing any of the Band buttons will cause the unit to automatically enter manual mode or you may press and release the Mode button until the Mode LED is on. This mode is self-explanatory. In Bypass mode, no filters are selected. Note that you cannot enter Bypass mode when the unit is configured for external control. The Bypass LED will also indicate no filters selected when in Auto or Manual modes. When used in a ShackLAN system, you will need to set the radio number of the Bandpasser so it tracks the band on the desired radio. This is done by pressing and holding the Mode button while pressing one of the band buttons for the desired radio number. The band buttons, from left to right, are numbered radio 1 to radio 4. Upon releasing the buttons the green LED for the selected radio will flash three times along with either the 15 m LED or 10 m LED to indicate Auto mode lock status. The Bandpasser then returns to normal operation. When controlling the unit via the Remote connector it is possible for the external decoder to select one band while you select a different band with the front panel controls. For this reason, it is advisable to lock the Bandpasser in Auto mode when controlling via the Remote connector. To lock the unit in Auto mode, press the 15 m button while holding down the Mode button. The unit will acknowledge the command by flashing the 15 m LED three times. Unlock the unit by pressing the 10 m button while holding down the Mode button. The 10 m LED will flash three time to indicate a successful operation. 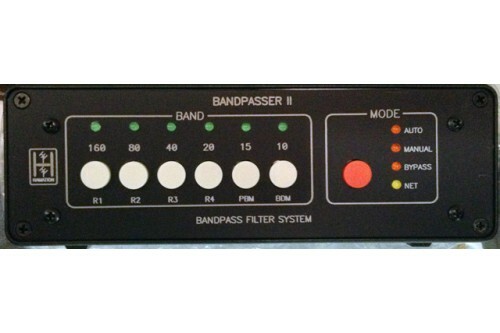 The Bandpasser II can be configured to use K3/Yaesu band data directly or single inputs for each band. Select the Per Band Mode by pressing and releasing the PBM button while holding in the MODE button. Configure the unit for Band Data Mode by pressing and releasing the BDM button while holding in the MODE button. The configuration will be verified by flashing the proper LED three times. AS-1.8HPF-RX - Broadcast Band Rejection Receive-Only Filter, with RCA jacks. This filters are available only with RCA female connectors. There is room to DYI BNC connector..
200 W CW / 400 W SSB Band Pass Filter for 12 m Insertion Loss (S21) plot To see more about W3NQN f..
200 W CW / 400 W SSB Band Pass Filter for 15 m Insertion Loss (S21) and Return Loss (S11) plots To..
200 W CW / 400 W SSSB Band Pass Filter for 17 m Insertion Loss (S21) plot To see more about W3NQN ..
200 W CW / 400 W SSB Band Pass Filter for 20 m Insertion Loss (S21) and Return Loss (S11) plots To..
200 W CW / 400 W SSB Band Pass Filter for 30 m Insertion Loss (S21) plot To see more about W3NQN f..
200 W CW / 400 W SSB Band Pass Filter for 40 m Insertion Loss (S21) and Return Loss (S11) plots To..
200 W CW / 400 W SSB Band Pass Filter for 60 m Insertion Loss (S21) plot To see more about W3NQN f..
200 W CW / 400 W SSB Band Pass Filter for 80 m Insertion Loss (S21) and Return Loss (S11)..
200 W CW / 400 W SSB Band Pass Filter for 160 m Insertion Loss (S21) and Return Loss (S11) plots T.. 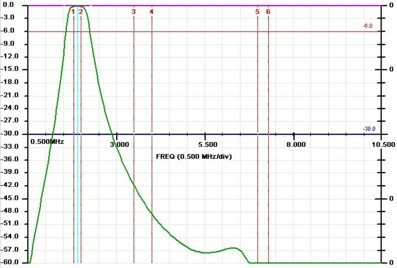 Band Pass Filters for Military Amateur Radio Service. 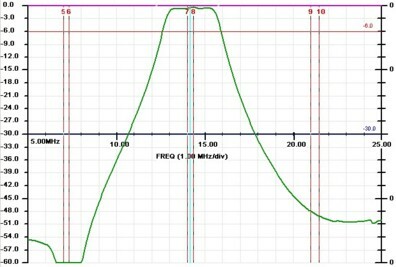 Specify frequencies. To see more about W3NQN ..
W3NQN Design Set of 6 Cauer Elliptical filters (160 - 80 - 40 - 20 - 15 and 10 m bands or from the three WARC bands, 30 - 17 and 12 m) - $770.00 if purchased individually.